The solid reputation of Swedish death metal didn´t happen overnight. Many a band had a short lifespan during the nineties. 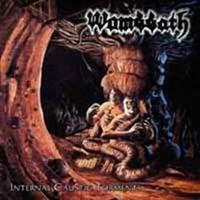 WOMBBATH had their period in the first half of the nineties, and this release celebrates its 20th anniversary and is augmented by the “Brutal Mights” (1992) and the 7” EP “Several Shapes” (1992). The line-up of Tomas LIndfors, vocals, guitarists Håkan Stuvemark and Tobbe Holmgren, bss player Richard Lagberg and drummer Roger Enstedt did most right. The various stages shown during 1992-93 are most interesting as the three versions of “Beyond the Gloomy” tell. The album itself is a mighty and varied piece with top-notch tracks such as “Prevent Anemia”, “Corporal Punishment”, Beyond the Gloomy” and “Intestinal Bleeding”. The rest is not far behind. The demo is more hit and miss meaning that “Tales from the Darkness” is slightly less inspired. But all in all the worst moment is the revamped “20:13 Silence Unveiled”, which is “As Silent as the Grave” turned in to modern metal. WOMBBATH sure made the most of pace changes, classic growl, un-grinded drums and truly classic death metal the Swedish way. If you´re into Old School death metal without black and thrash influences this is your best buy.